Welcome back to my blog! 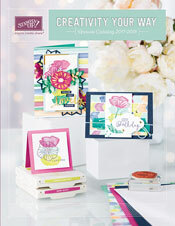 Today, I have 3D project to share with the Oh, Hello set from the current Spring Catalog. Believe it or not, this is one of those projects that I didn't spend a lot of time planning in advance. It just sort of came together. First, I took a piece of white cotton muslin fabric, colored the rose image from the stamp set with Calypso Coral and Lucky Limeade markers, and stamped it on the fabric strip, rotating it as I stamped. Then, I made little bag from the yellow chevron print out of the Essentials Designer Fabric pack. I cut a strip, folded it in half right sides together, stitched up the sides with my sewing machine and turned it inside out. Then, I hand stitched the stamped strip to the bag. I also turned down the top edge, and hand stitched it at about 1/4". I then threaded Lucky Limeade Baker's Twine in two directions through the stitched top, so the twine could be used to cinch the bag shut. This bag is the right size for a gift card, some candy or other little trinket to give as a gift. For the tag, I cut a strip of cardstock the same width as the long edge of the Decorative Lable Punch, and punched it at one end only. So, the tag has a pretty border at the top. Then, I stamped the chevron oval with So Saffron ink, and the greeting in Lucky Limeade over the top. The rose was colored with Calypso Coral and Lucky Limeade markers, and stamped at the bottom of the tag. I added a So Saffron Designer Button, attached it to the bag with a Vintage Trinkets Accents & Elements safety pin in the bronze color. As a final touch, I tied a piece of Calypso Coral Ruffled Ribbon to the safety pin. I really love how this one turned out, and so I think I should make another to keep! Well, that is all for today. Please visit me again soon as I have lots of Sale-A-Bration samples to share as well as review my Christmas 2012 cards and December Daily album. Thanks for stopping by!